In a previous chapter, I wrote about living in the fens under it’s vast expansive sky. It gives one a feeling of being small and insignificant. It is why some people do not appreciate living in the fens. #RobertNewtonHurley (1894-1980) is an artist who’s landscapes describe the vastness of a land which he came to love. Robert Newton Hurley was born in Bromley-by-Bow, London, England; immigrated to Saskatoon, Saskatchewan in 1923; he died in Victoria, British Columbia. He apprenticed as a printer-compositor until his mid 20s. WWI saw him serving with the Suffolk Regiment from 1917 to 1920 after which he emigrated to Canada (1923). Robert Hurley lived through the Great Depression and it was during this time that he started to paint. Being unemployed, Hurley was unable to afford artist paper or painting supplies so he began painting using berry juices and a toothbrush on newsprint. He had no formal training in the arts but living in London he frequently visited the museums and galleries in the city. From 1933-35 he took night classes from established artist Ernest Lindner. He quickly became known in Saskatchewan and other parts of Canada for his treatment of the prairie landscape. The Hurley watercolour in my collection is typical of his style. Hurley focused on prairie landscapes in which grain elevators, receding roads, fence lines, and telephone poles are integral. His use of colour and stylised objects became his trademark. Hurley has been called Saskatchewan’s “sky painter” for his effective use of watercolour to illuminate the prairie sky. Hurley’s portrayals of prairie light and space as well as his flat, linear treatment of the landscape are expressed using broad colour washes and a linearity of line. So typical and so beautiful. 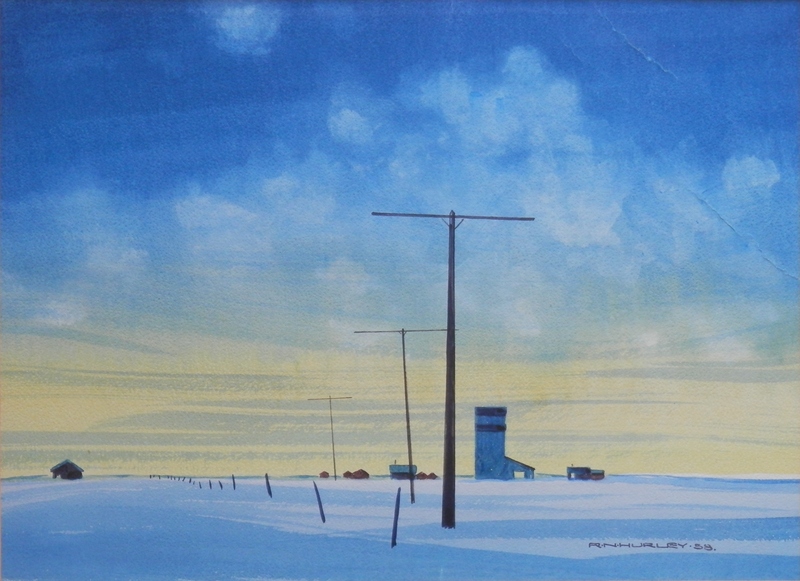 This entry was posted in Watercolour paintings and tagged Canada, fence line, grain elevator, prairie, Robert Newton Hurley, telephone pole. Bookmark the permalink.